THE High Court of Bombay in Goa has come down heavily on the state’s coastal village panchayats for structures built in violation of the coastal regulation zone (CRZ) notification 1991. CRZ regulates activities on coastal stretches within 500 metres of the high tide line on the landward side. On June 14, the court ordered the panchayats to file detailed affidavits about illegal structures demolished, and the status of structures whose cases are still pending before the Directorate of Panchayats. A number of property owners had approached the directorate to appeal against the demolition. A final decision on the matter is pending. 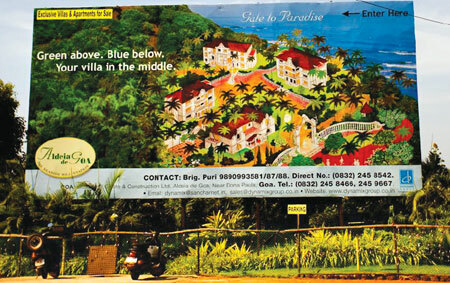 Following an article in a Goa newspaper on July 31, 2006, that pointed out CRZ violations, the court suo moto filed a writ petition and issued orders—the 24 coastal village panchayats and two coastal municipalities had to “identify from the Directorate of Settlement and Land Record survey maps, structures existing within CRZ-III as on 19-2- 1991”. Structures built after 1991, the year the regulation came into effect, had to be issued show-cause notices and the respective panchayat or municipality had to demolish them. The court added, “The demolition process shall not operate in cases where the owners/ possessors of such illegal structures have approached the higher authority and obtained a stay.” Taking advantage of this clause, most owners approached the Directorate of Panchayats. In the past four years, only 114 illegal structures have been demolished against a total of 6,983 (see graph). According to the information furnished before the court, in South Goa district, of the 154 structures listed for demolition, only 99 were razed. The rest managed to secure a stay. In Calangute, the Queen of Beaches, just nine of the 40 marked for demolition were razed. The rest approached the directorate. Those who did not have the means to file an appeal lost their homes. Most of these homes were of fishers. Matanhy Saldanha, general secretary of Goenchea Raponkaraco Ekvott (association of Goa’s traditional fishermen, raponkar), is livid: “The government has done nothing to protect fishers.” The CRZ notification provides for construction and reconstruction of dwelling units of communities in the CRZ area, he commented, but this clause has not been implemented. “The law has a provision. All the government had to do was file an affidavit in the court saying that such and such structures belong to traditional fishermen, toddytappers and others involved in traditional occupations,” Saldanha added. Down To Earth got in touch with Michael de Souza, member secretary of the Goa Coastal Zone Management Authority and director of the Science and Technology department, for his comment, but he did not reply by the time this story went to press. Fishers claim the state government liberally granted building permissions even in the no-development zones (NDZ). 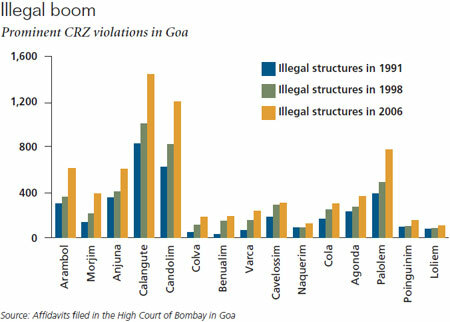 In popular tourist beach villages like Candolim and Calangute in North Goa and Palolem, Agonda and Varca in South Goa, the number of structures in the NDZ increased almost three times. It was only after the court’s intervention that new construction was stopped. Five years ago a house in Betalbatim village was one of the first houses to be demolished by the order of supreme court because it was built on the sand dune with in 100m and the funny part is that its bought by a well known bussinessman and its under construction full swing day and night located right side of bollywood resort next to sunshine restaurant I just want to see where is the justice????? This illegality regarding the CRZ, is not an exception. It is part of the Constitution of Goa.These are special and exclusive rules for the political, economic and judicial class. It is their god given right to exploit and oppress the poor.They are the Indian untouchables. They are the same people who preach the virtues of honesty and transparency, not for themselves, but for the rest of the citizens.They have a divine right bestowed upon them to lie, cheat, destroy the land, pollute the rivers, etc,etc,etc. You name it they are blessed with these powers.The word illegality does not appear in their vocabulary. It is a wonderful world for these progressive mafia.. Maybe the other contributors can add to this list of institutionalised corruption that prevails in our beautiful land called Goa.May Matanyha Saldhana's soul rest in peace.